And was the first to drink what was offered. And Justin bends his head. Being beheaded you distribute divine grace. Bearing the lot from God to have his head cut off. Being beheaded you are a beast of prey for the salvation of your soul. Whose sword in hand strikes you in the neck. Liberian has the superior limb of his head. 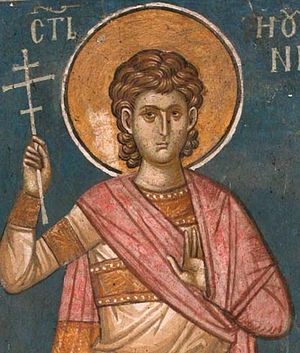 The Holy Martyr Justin the Philosopher (also known as Justin Martyr) was born around 114 at Sychem, an ancient city of Samaria. He called himself a Samaritan, although his father, Priscos, and grandfather, Baccheios, may have been pagan Greeks. From his childhood he displayed intelligence, love for knowledge and a fervent devotion to the knowledge of truth. 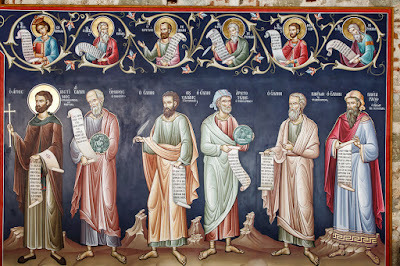 When he came of age he studied the various schools of Greek philosophy: the Stoics, the Peripatetics, the Pythagoreans, the Platonists, and he concluded that none of these pagan teachings revealed the way to knowledge of the true God. In his thirtieth year, Justin accepted Holy Baptism (between the years 133 and 137). 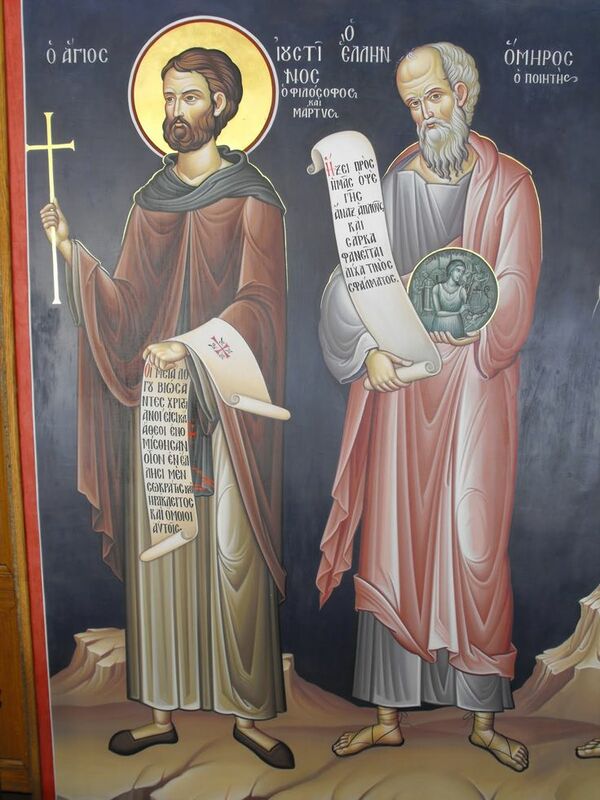 From this time he devoted his talents and vast philosophical knowledge to preaching the gospel among the pagans. He began to journey throughout the Roman Empire, sowing the seeds of faith. “Whosoever is able to proclaim truth and does not proclaim it will be condemned by God,” he wrote. Justin opened a school of Christian philosophy. He subsequently defended the truth of Christian teaching, persuasively confuting pagan sophistry (in a debate with the Cynic philosopher Crescens) and heretical distortions of Christianity. He also spoke out against the teachings of the Gnostic Marcian. In the year 155, when the emperor Antoninus Pius (138-161) started a persecution against Christians, Saint Justin personally wrote him an Apology in defense of three Christians innocently condemned to execution, Ptolemy and Lucias. The name of the third remains unknown. In the Apology he demonstrated the falseness of the slander against Christians accused unjustly for merely having the name of Christians. The Apology had such a favorable effect upon the emperor that he ceased the persecution. Justin journeyed, by decision of the emperor, to Asia Minor where they were persecuting Christians with particular severity. He proclaimed the joyous message of the imperial edict throughout the surrounding cities and countryside. The debate of Justin with the Rabbi Trypho took place at Ephesus. 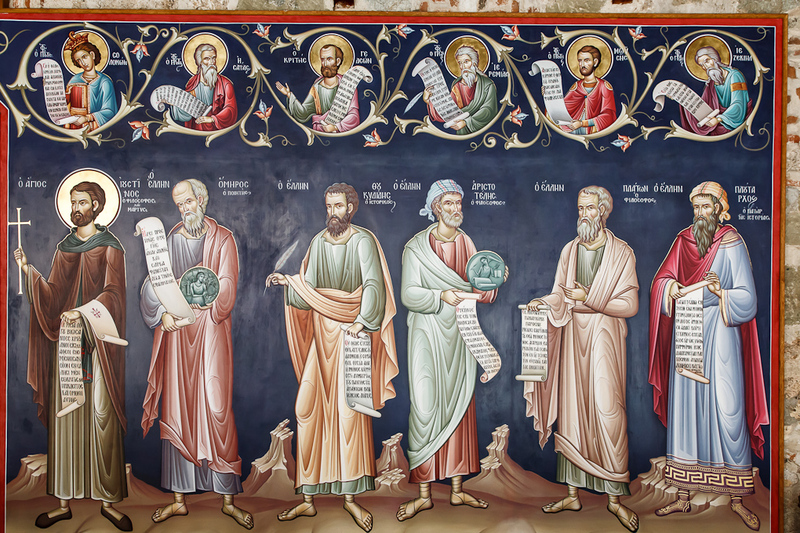 The Orthodox philosopher demonstrated the truth of the Christian teaching of faith on the basis of the Old Testament prophetic writings. Justin gave an account of this debate in his work Dialogue with Trypho the Jew. A second Apology of Saint Justin was addressed to the Roman Senate. It was written in the year 161, soon after Marcus Aurelius (161-180) ascended the throne. When he returned to Italy, Justin, like the Apostles, preached the gospel everywhere, converting many to the Christian faith. When the Saint arrived at Rome, the envious Crescens, whom Justin always defeated in debate, brought many false accusations against him before the Roman court. Saint Justin was put under guard, subjected to torture and suffered martyrdom by beheading in 165. The relics of Saint Justin the Philosopher rest in Rome. The prefect proposed to all the Christian prisoners that they offer sacrifice to the pagan gods. 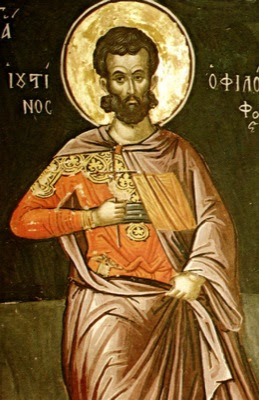 When they refused he issued a sentence of death, and the Saints were beheaded, thus receiving from God the crown of martyrdom. Thou didst empty the cup of the wisdom of the Greeks, and thou didst thirst yet again, till thou camest unto the well where thou foundest water springing to eternal life. And having drunk deeply thereof, thou didst also drink the cup that Christ gave to His disciples. Wherefore, O Justin, we praise thee as a philosopher and Martyr of Christ. O Justin, teacher of divine knowledge, thou didst shine with the rays of true philosophy, and wast wisely armed against the enemy. Confessing the truth thou didst contend with the martyrs: with them ever entreat Christ our God to save our souls. 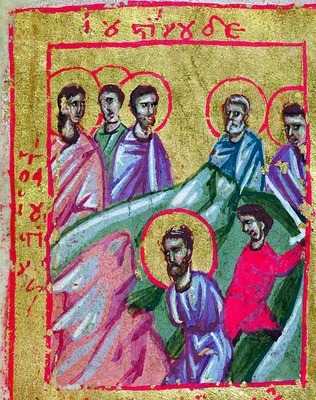 As the breath of Paradise, the dew descending from Aermon, Christ the Power and the Peace and Wisdom of God the Father, came upon thy thirsting spirit, O Martyr Justin, making thee a spring of knowledge for all the faithful, when thou barest with true valour death as a martyr, to live forever in Christ. The whole Church of God is adorned with the wisdom of your divine words, O Justin; the world is enlightened by the radiance of your life. By the shedding of your blood, you have received a crown. As you stand before Christ with the angels, pray unceasingly for us all. Rejoice you who shine with wisdom, as being self-wise, you served Christ, for Whom you gloriously contested Justin, and Who in return glorifies you unto the ages, O glorious one.